Statistically the most successful driver in F1 history, Michael Schumacher utterly dominated the sport in the early part of this decade. Famed for his relentless pace and supreme ability to pump in quick times at crucial moments in races, Schumacher can make a case to be called the most complete F1 driver ever. Sometimes controversial and always uncompromising, Schumacher, like most champions, had great desire, speed and racecraft. But his work ethic, supreme fitness and ability to galvanise teams around him were the qualities that really made him stand out. After taking his first two world titles with Benetton in 1994 and '95, Schumacher took key personnel with him to Ferrari and hauled F1's most successful team out of a serious slump. 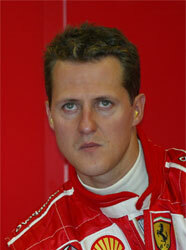 With Schumacher on board, Maranello enjoyed unprecedented success. The German scored 72 grand prix wins and five consecutive drivers titles from 2000-2004. Should Michael Schumacher be higher or lower in F1's greatest drivers?